Laarman has spent the past few years working on the edge of digital fabrication–a few years back he created chairs based off an algorithm that could ape the structure of human bones and tree growth. These days he’s focused on creating his furniture-as-art pieces in stronger materials, like metal. 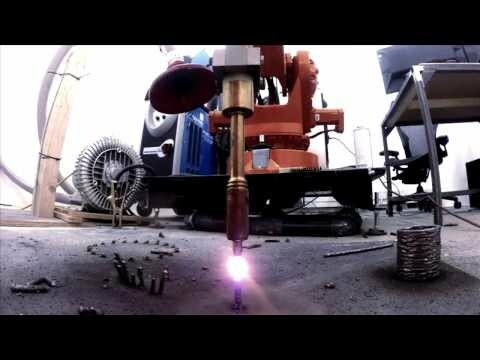 Here’s how MX3D-Metal works: A robotic arm–the same kind used in car manufacturing or at Amazon’s shipment centers–with a computer-controlled metal welding machine starts to deposit molten metal onto an existing metal surface. Once the initial bit of metal is fused with the surface, the extrusion tip of the arm starts to work like a hot glue gun, or even like a Makerbot, by emitting small amounts of molten material at a time. The arm is controlled by new software Autodesk created that can give the robot more fluid instructions for where the metal should go. Because of how quickly the metal hardens, the new object doesn’t need an additional support structure. Laarman’s studio will be employing it first to create a sculptural bench (which will exhibit at New York’s Friedman Benda gallery this May). “Like it did with the spread of information, digital technology is now also starting to define an evolution in the way we design, manufacture, distribute, and even recycle physical products,” Laarman tells Co.Design.